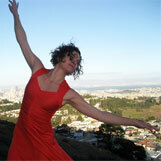 Jessica Lawing Adams has been a San Francisco-based dancer, choreographer and teacher since 1995. She holds a BFA in Dance from California Institute of the Arts, and since 2000 has been studying and teaching conscious fitness modalities. Jessica’s choreographic work has been produced in many dance festivals and showcases, including summerfest/dance, ODC’s Pilot and Flight programs, Vision Series and self-produced works. Jessica has worked with Rapt Performance Group, Joe Goode, Kim Epifano, Scott Wells and many others. Her modern dance class stems from her love of being inverted with an interest in building strong technique and expansive movement. 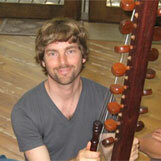 Daniel Berkman is a San Francisco based composer, multi-instrumentalist, electronic musician and innovator of electro-acoustic music specializing in the Kora (a 21-stringed West African Harp). After studying composition and percussion at the Hartt School in Hartford, Connecticut in the early nineties, Daniel pursued his music career in San Francisco for it’s artistic diversity, creativity and opportunity. Between 1998 and 2008 Daniel has written scores for dozens of dance companies and choreographers such as ODC, Kunst-Stoff, Sara Shelton Mann, Lizz Roman, Dandelion Dance Company, Company Mechanique, Stacy Printz Dance Project, Heidi Schweiker, Janice Garrett and many others. He is also a faculty member at San Francisco Ballet. His experience in both presenting live corporate performances and composing private media scores include such companies as Google, Yahoo, Babcock & Brown, The U.S. Marines, Landor & Associates, Millipore and others. Daniel is also a recording artist in his own right with two highly acclaimed CD’s, “Calabashmoon” and “Heartstrings”, featuring his work with Kora and electronics and available at www.magnatune.com His debut solo electronic CD “Tape”, released under the moniker “Colfax” is now available on iTunes.